A Seoul public transit bus is fast approaching a crosswalk. Even though the traffic light is red (for the bus), the bus driver knows too well the light will soon turn green (for him to proceed). So he decides not to slow down. Meanwhile, a cyclist (on a sidewalk) is about to use that very crosswalk (like in the photo above). The cyclist starts to cross when the “walk” signal is almost over (i.e., only one “green bar” remaining on the countdown timer). Alas, the bus hits the cyclist head-on (in the middle of the crosswalk), and the cyclist is killed instantly. FYI: At the moment of collision, it was green light for the bus (i.e., “don’t walk” signal for the pedestrians), and the cyclist was riding his bicycle across. The family of the dead cyclist sues the bus company’s insurer. Was the bus driver at fault? How is a Korean court likely to decide? The above example is very similar to an actual case recently reported here in Korea. The Seoul Central District Court found the bus driver/company 60% responsible (i.e., the cyclist only 40% responsible). Their insurer was ordered to pay the family about 200 mil won (USD 170,000). Simply put, the bus driver should have slowed down as he was approaching the crosswalk. He should have known/anticipated that somebody could always start crossing very late. 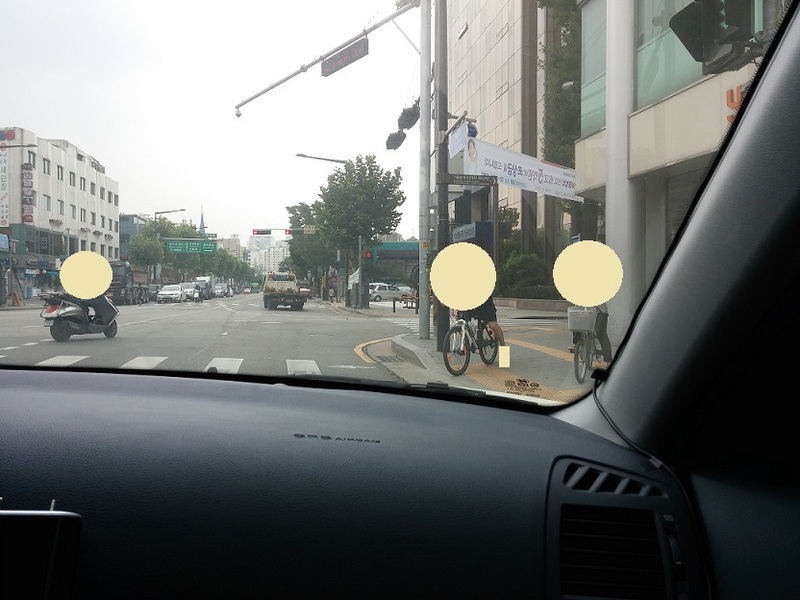 In Korea, all motorists have a general legal obligation to attentively look ahead and drive defensively. In the court’s view: Had the bus driver slowed down, the collision could have been prevented. DID YOU KNOW? Sometimes, bicycles can actually be ridden when using a crosswalk. Like the crosswalk below. Still, I’ve seen some veteran cyclists recommend “bicycles always be walked/dragged” because many pedestrians are still unaware of what those lines mean. You can end up colliding with one such pedestrian. DID YOU KNOW? 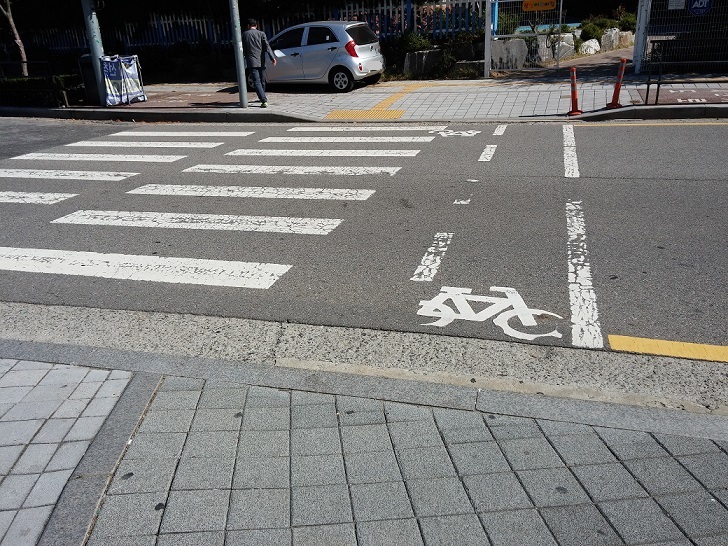 From 2010 to 2014, a total of 1,440 people lost their lives due to bicycle-related traffic accidents here in Korea. That’s an average of 288 deaths per year. Biking accidents are on the rise. OPINION: Sadly, I personally don’t see cycling safety (in Korea) improving a whole lot at least in the near future. That is why (right now) I cannot wholeheartedly recommend cycling to people in Korea. For the individual, the question is simple: whether it’s safe to ride today. The government should make cycling safer now. If the government is serious about promoting cycling, they shouldn’t be waiting around until there are more accidents. People should not have to pay with their lives. As a pedestrian, I don’t always blame cyclists for wanting to ride on sidewalks. I get it. They feel unsafe on the road. Just don’t hit me please. Was it reasonably foreseeable that someone could start crossing very late? Yes. Then, the bus driver should have slowed down. 1) The driver’s view was completely impeded by the bumper-to-bumper traffic on the other side. 2) A jaywalker suddenly emerged out of those cars. 3) The collision took place on the road outside of a crosswalk. 4) At the time of collision, the driver was not speeding. It’s always better not to end up in court even if you can win. So, please try to drive/ride/walk carefully and defensively. Especially in Korea. Not everyone knows the law or abides by it.